Give customers a memento that will always remind them of you with this LED zipper pull! 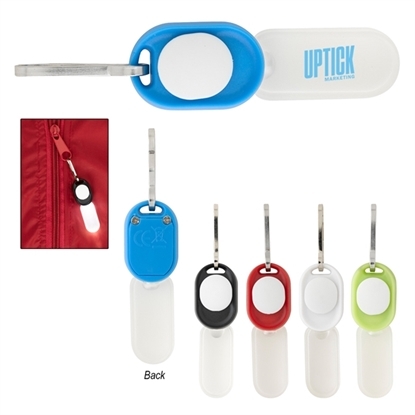 It features an extra-bright light, a push button to turn on and off, a slide to lock on, and a clip for attaching. A button cell battery is also included. This comes in black, blue, lime, red, and white and measures 2 7/8" x 5/8". Pad print this with your company name or logo and give this to clients for use on their jackets, bags, and more! Mypromotionalpens.com offers the largest and best priced selection in Promotional Zipper Pullers. We will price compete and we won't be under sold. Let our graphic designers make your personalized Zipper Pullers standout above the crowd at no charge. We won't stop until you are completely satisfied with your custom Zipper Pullers art proof.Use category search filters on your left to help narrow your search to find exactly what you are looking for.